That is an indirect quote from Wallace Stegner’s masterpiece, Angle of Repose, but more on that later. 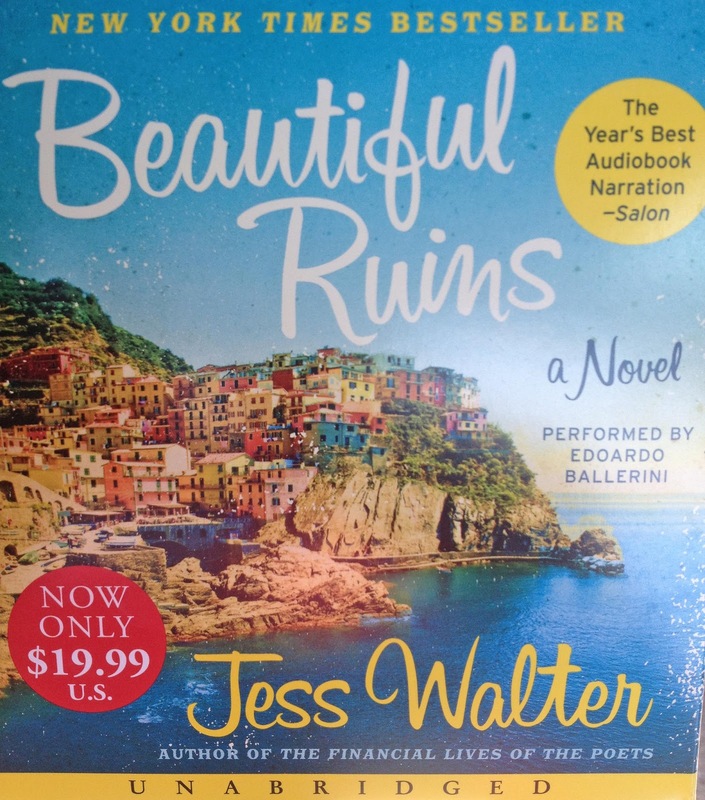 I thought of those few words as we headed north on I95 last week, fortified by yet another “book” – actually the 13 hour audio book version of Jess Walter’s Beautiful Ruins, a novel that has some things in common with Stegner’s. I had read Walter’s Financial Lives of the Poets on the maiden voyage of the cruise ship Marina, finding a copy in the ship’s pristine library. It is a very funny but tragic story, reminding me a little of the writing of Joseph Heller and I made a note to read his next work. Perhaps it was providential that Amazon had a sale on the audio book edition of his most recent novel, Beautiful Ruins, right before we departed Florida for Connecticut. While it is very professionally narrated, somehow I think the book might be better read than listened to. I can’t really explain why that might be; perhaps having it read to you makes you focus on plot rather than character, or the interruptions while being on the road forces one to stop listening when rest stops dictate. The story begins with Pasquale Tursi, who, after his father dies in 1962, returns from his partially completed college education to run the family’s small hotel in the out of the way Italian coastal town of Porto Vergogna There he has a chance meeting with a minor American actress, Dee Moray (she is in Italy to film Cleopatra with Richard Burton and Elizabeth Taylor). The story is a CD page turner (making the drive that much easier), moving back and forth from 1962 to the near present, with the introduction of a number of characters (including Richard Burton). It is like so many good novels the tale of choices and consequences. Walter’s characters interact with one another over time, changing the outcome of each others’ lives, “beautiful ruins” as some of the Italian landscape. Their stories devolve into their own “angles of repose.” Jess Walter continues his journey as a young ascending American novelist. As the novel moved around, so did we, first visiting friends Suzanne and George in Savannah, sharing a July 4 dinner with them and then the following night we made a long overdue visit to the relatively new home of our friends Barbara and Ron (and their particularly smart Border Collie, Coco) in Apex, NC. 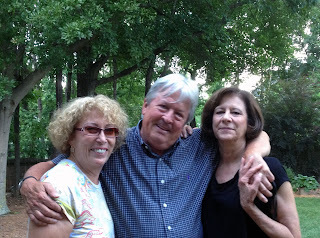 Ron was a colleague in my publishing days (and Barbara as well, but Ron and I worked at the same firm) and over the years we’ve become close friends in spite of our geographic estrangement. It was wonderful seeing them after all these years. Then, back on the road. 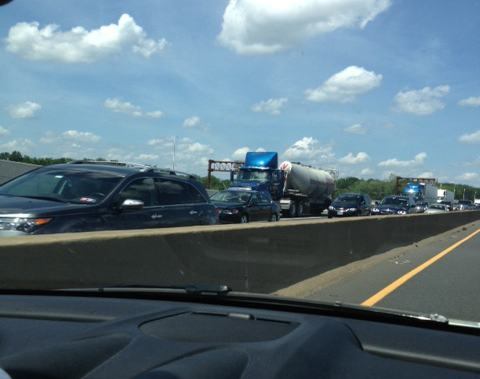 The drive up I95 is emblematic of living too shallowly in too many places. As a nation we’ve become anchorless, a nomadic nation addicted to the so called “pleasures” of travel. 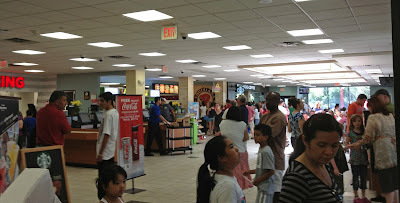 Even with gas at $4 plus a gallon the roads were packed, the “rest stops” jammed with those seeking burgers, fries, ice cream, pizza, and sodas. We’ve learned over the years to pack our own food, and to confine our rest room visits to visitors’ centers, usually the first rest stop as you enter the next state. With the NJ Turnpike, though, one has to do battle with the Burger King crowd and the downtrodden, overused bathrooms. I have no business wondering the where’s or why’s of this moving mass of humanity, as I am one of the rootless, but, in our case, trying to “go home” again, to where we spent most of our lives in Connecticut. However, with each passing year, the ties to the past unravel more, and we are more strangers than natives, in spite of our love of the area. One does not put down roots in Florida to offset this loss it seems, as one’s neighbors are from someplace else, and they are wanderers as are you. 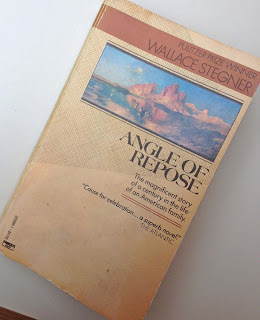 Indeed, we live too shallowly in too many places, bringing me to this great American novel, certainly one of the best of the 20th century, Wallace Stegner’s Angle of Repose. Something made me think of you today, so I Googled your name, and Google led me to your blog. I wonder if you'll even remember me. My memories of you are no doubt washed by the passage of time, but how nice that I get to share some of this with you. In 1969, you hired me as your secretary at Johnson Reprint. I was 20 years old, my typing was pathetic, my shorthand practically non-existent, I had no real secretarial experience, and I had just moved to New York from Meadville, Pennsylvania. Yet for some reason I will never understand you saw potential and offered me the job. It wasn't long after that you left Johnson for greener pastures, and I cut my hair short in protest. Though of course, no one but me cared how long my hair was. And now, 44 years later, I get to thank you. You were really my first mentor, and you encouraged me to think analytically and take my silly attempts at writing poems to a deeper level. You also taught me a great deal about being a professional--although there was certainly a lot more to learn, you got me over the threshold. And the position itself provided me with skills that served me well throughout my career. A position for which I was completely unqualified. I have always felt that you played a brief but seminal role in my life. 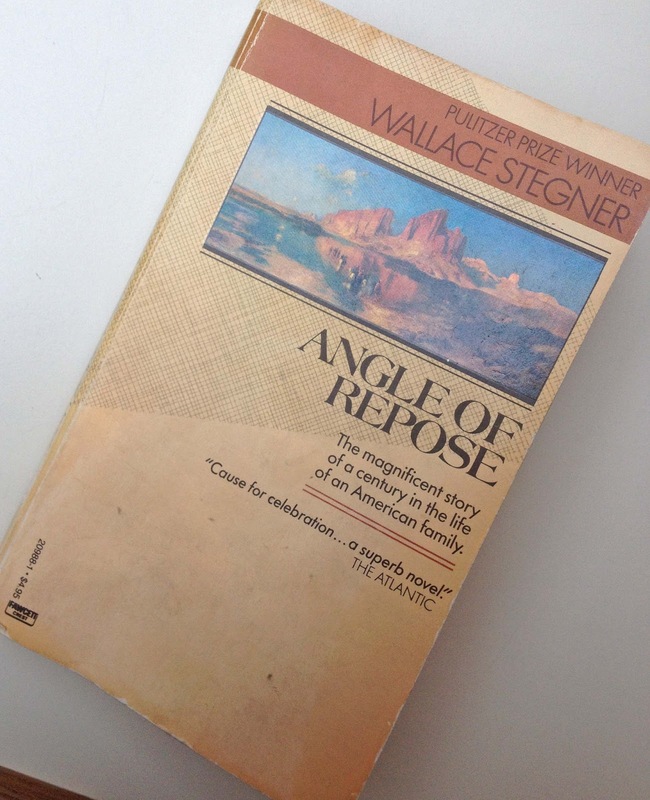 Have you read Wallace Stegner's Angle of Repose? He talks about a Doppler effect (nothing to do with weather) that I couldn't possibly do justice to, so in brief, it is a sort of predestination view but not really. If you are curious and haven't read it, you will just have to do so! Anyhow, I mention it because it has become more and more of an intriguing concept for me over time. When I think back on 1969 as a fragment of my life, I marvel at where my path was to take me. And that at the time, of course, it was unwritten. …. This probably makes no sense whatsoever to you! But it does to me, and it's beginning to feel like I'm writing this more for myself than you. My apologies if it feels that way to you too! Well, what I started out wanting to say is thank you. For being who you were at a juncture in my life and providing me with a chance, though you didn't know it any more than I did at the time, to build a springboard for myself to carry me into a fascinating and sweet journey. I am truly happy to know that your own life has been, and continues to be, so full of love and friends and success. You earned all that a long time ago just by being your intuitive and generous self. Naturally, I was moved by this, responding, “As you didn't type well or take shorthand, I must have hired you for your intelligence which has obviously taken you to an education and a career of many accomplishments.” I also said, “I haven't read Wallace Stegner's Angle of Repose, but have ordered it from Amazon on your recommendation. 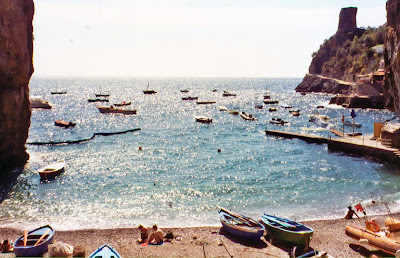 I get to read a lot during the summers when we live on our boat in Norwalk; sounds like an ideal summer read.” Since then Mary and I have struck up an email relationship, two small characters on the world stage whose lives once intersected and, now, thanks to technology, intersect virtually. But, there you have it, a bend in time, perhaps the Doppler Effect, leading me to one of the more significant literary works of our time. Stegner’s story is multigenerational; a tale told by Lyman Ward, a 58 year-old former history professor who is now confined to a wheelchair, taken care of by friend and neighbor Ada Hawkes and her daughter Shelly in the home of Ward’s grandparents, Susan and Oliver Ward. It was in this California home his grandparents finally settled after living in a number of frontier outposts during the formative years of their marriage. Lyman Ward’s father, Ollie, was the oldest of their three children. Part of Stegner’s novel is devoted to present-day Lyman, who is trying to stay independent in spite of his being wheelchair bound, while his only son, Rodman, is trying to place him in an assisted living home. But Lyman is fiercely opposed to the idea. He is now also divorced from his wife, Ellen. But the majority of the story is the one that Lyman Ward is trying to write about his grandmother, an extraordinary women of letters and an artist as well, who marries a young engineer, reluctantly leaving her best friend Augusta, and the Northeast, to join Oliver (she thinks for only a few years before a planned return to the East) in his quest to pursue a career as a mining engineer in the West. Actually, the character of Susan Burling Ward is based on the real life of Mary Hallock Foote, and Stegner makes liberal use of Foote’s writings in the novel, which led to some controversy although Stegner acknowledges that use saying that he did not hesitate “to warp personalities and events to fictional needs.” At times it almost feels like an epistolary novel, although all letters are one sided, from Susan to Augusta. Augusta’s life is firmly within the gravitational pull of the eastern intelligentsia, a life that Susan pines for, for herself and for her children. If Henry Adams, whom you knew slightly, could make a theory of history by applying the second law of thermodynamics to human affairs, I ought to be entitled to base one on the angle of repose, and may yet. There is another physical law that teases me, too: the Doppler Effect. The sound of anything coming at you - a train, say, or the future - has a higher pitch than the sound of the same thing going away. If you have perfect pitch and a head for mathematics you can compute the speed of the object by the interval between its arriving and departing sounds. I have neither perfect pitch nor a head for mathematics, and anyway who wants to compute the speed of history? Like all falling bodies, it constantly accelerates. But I would like to hear your life as you heard it, coming at you, instead of hearing it as I do, a sober sound of expectations reduced, desires blunted, hopes deferred or abandoned, chances lost, defeats accepted, griefs borne…. You yearned backward a good part of your life, and that produced another sort of Doppler Effect. Even while you paid attention to what you must do today and tomorrow, you heard the receding sound of what you had relinquished. Yet do you remember the letters you used to get from isolated miners and geologists and surveyors who had come across a copy of Century or Atlantic and seen their lives there, and wrote to ask how a lady of obvious refinement knew so much about drifts, stopes, tipples, pumps, ores, assays, mining law, claim jumpers, underground surveying, and other matters? Remember the one who wanted to know where you learned to handle so casually a technical term like "angle of repose"? I suppose you replied, "By living with an engineer." But you were too alert to the figurative possibilities of words not see the phrase as descriptive of human as well as detrital rest….As you said, it was too good for mere dirt; you tried to apply it to your own wandering and uneasy life. It is the angle I am aiming for myself, and I don't mean the rigid angle which I rest in this chair. I wonder if you ever reached it…. Wheelchair bound, and distraught and cynical about the present (the 1970s), by exploring (and glorifying) her life, Lyman temporarily finds a way out of his: Fooling around in the papers my grandparents, especially my grandmother, left behind, I get glimpses of lives close to mine, related to mine in ways I recognize but don't completely comprehend. I'd like to live in their clothes a while, if only so I don't have to live in my own…. We have been cut off, the past has been ended and the family has broken up and the present is adrift in its wheelchair. I had a wife who after twenty-five years of marriage took on the coloration of the 1960s. I have a son who, though we are affectionate with each other, is no more my true son than if he breathed through gills. That is no 'gap between the generations, that is a gulf. The elements have changed, there are whole new orders of magnitude and kind. This present of 1970 is no more an extension of my grandparents' world, this West is no more a development of the West they helped build, than the sea over Santorin is an extension of that once-island of rock and olives. ….My grandparents had to live their way out of one world and into another, or into several others, making new out of old the way corals live their reef upward. I am on my grandparents' side. I believe in Time, as they did, and in the life chronological rather than in the life existential. We live in time and through it, we build our huts in its ruins, or used to, and we cannot afford all these abandonings. I wonder if ever again Americans can have that experience of returning to a home place so intimately known, profoundly felt, deeply loved, and absolutely submitted to? It is not quite true that you can't go home again. I have done it, coming back here. But it gets less likely. We have had too many divorces, we have consumed too much transportation, we have lived too shallowly in too many places. I doubt that anyone of Rodman's generation could comprehend the home feelings of someone like Susan Ward. Despite her unwillingness to live separately from her husband, she could probably have stayed on indefinitely in Milton, visited only occasionally by an asteroid husband. Or she could have picked up the old home and remade it in a new place. What she resisted was being the wife of a failure and a woman with no home. When frontier historians theorize about the uprooted, the lawless, the purseless, and the socially cut-off who settled the West, they are not talking about people like my grandmother. So much that was cherished and loved, women like her had to give up; and the more they gave it up, the more they carried it helplessly with them. It was a process like ionization what was subtracted from one pole was added to the other For that sort of pioneer, the West was not a new country being created, but an old one being reproduced; in that sense our pioneer women were always more realistic than our pioneer men. The moderns, carrying little baggage of the kind that Shelly called "merely cultural," not even living in traditional air, but breathing into their space helmets a scientific mixture of synthetic gases (and polluted at that) are the true pioneers. Their circuitry seems to include no atavistic domestic sentiment, they have suffered empathectomy, their computers hum no ghostly feedback of Home, Sweet Home. How marvelously free they are! How unutterably deprived! As a practitioner of hindsight I know what Grandfather was trying to do, by personal initiative and with the financial resources of a small and struggling corporation, what only the immense power of the federal government ultimately proved able to do. That does not mean he was foolish or mistaken. He was premature. His clock was set on pioneer time. He met trains that had not yet arrived, he waited on platforms that hadn't yet been built, beside tracks that might never be laid. Like many another Western pioneer, he had heard the clock of history strike, and counted the strokes wrong. Hope was always out ahead of fact, possibility obscured the outlines of reality.